Below is the first installment of a history paper which I wrote last year, the 500th Anniversary of the official beginning of the Protestant Reformation. The occasion for this paper was first suggested years ago in conversations with an Anabaptist friend and good Christian brother who objected to Calvin and Calvinism for three reasons: Calvin's doctrine of predestination, Calvin's acceptance of infant baptism, and the fact that Calvin was entirely responsible (in my friend's mind) for burning Michael Servetus at the stake simply because he rejected infant baptism. Without condoning or defending the burning of heretics, I knew that there was far more involved in this incident than merely Servetus's view of baptism--Calvin wrote and debated against other Anabaptist's in his day, after all, and did not call for their deaths. Yet in the back of my own mind, I always wanted to truly know how things fell out, what exactly Servetus's heretical views were, and just what role Calvin played in Servetus's trial and condemnation. In my research, I was surprised to discover that Michael Servetus is credited as possibly the first person to have discovered/hypothesized the pulmonary circulation of the blood. This fact, combined with his death at the stake in Geneva during Calvin's tenure there, means that the vast majority of references to Servetus in the University of British Columbia's libraries are not in the theology section but the medical libraries, and the articles and books referring to him often spend a bit of time speaking of him as a heroic martyr for the cause of experimental science who was persecuted for his liberal and rational views in an era where the narrow minded and omnipotent church tried to crush scientific innovation and rational learning. Thus, Calvin gets tarred and feathered by these medical articles for a tyrannical, vindictive despot who was against free thinking, against science and the enemy of anyone who opposed his dogmatic, medieval views. Not a few of these articles insinuate that not much has changed with the church's perspective on science since then. The truth, as usual, is far more interesting and complicated and reminds one that such scientists should stick to science and not make sweeping historical or theological judgments about matters they have not taken the time to understand. It was not the intellectual heirs of Calvin, after all, who sent countless thousands to the guillotine two centuries later, but the secularists and rationalists who rejected both Reformed and Roman Catholic Christianity for Enlightenment principles. It seems that Enlightenment secularists were just as willing to execute heretics as any era of Christianity ever had been, perhaps more so. And Servetus was not the rational debunker of religion that these writers imagine him to be--he not only held to many Gnostic formulations of doctrines of the godhead and the two natures of Christ (spending far more time studying and writing about Scripture than he ever did about medicine or science), he actually believed he was Michael the archangel, incarnated in the last times, to help the Lamb fight the dragon and the beast in the apocalyptic end of the world. In the paper below, I do not attempt to clear Calvin of the responsibility he bears in the Servetus affair, but I do attempt to put things in their historical context rather than simply reading our current notions of tolerance back into an age where they had yet to take hold. The paper below is in no way comprehensive but represents a summary of my findings. As stated, below is part 1 of my paper. Many people’s impression of Calvin is accurately voiced by Voltaire, who viewed Calvin as “the pope of the protestant party,” holding “absolute power over consciences,” with the “spirit of a tyrant.” Voltaire’s “contempt” for Calvin stemmed from his holding Calvin responsible for Servetus’s execution. But was Calvin really the all-powerful and vindictive dictator of Geneva, solely responsible for the condemnation and death of Servetus, a man whose only fault was to disagree with Calvin’s theology? To answer this question, it is necessary first to look briefly at how their lives intersected. Servetus lately wrote to me, and coupled with his letter a long volume of his delirious fancies, with the Thrasonic boast, that I should see something astonishing and unheard of. He takes it upon him to come hither, if it be agreeable to me. But I am unwilling to pledge my word for his safety, for if he shall come, I shall never permit him to depart alive, provided my authority be of any avail. Some see in this foreboding remark Calvin’s intention to destroy Servetus, but Calvin's letter proves that, though he knew it was Servetus he corresponded with, he did not betray his confidence and expose him. Years later, however, Calvin would be involved in Servetus’s exposure and arrest in France. Scholars debate Calvin’s role in Servetus’s trial and conviction of heresy by the Inquisition in Lyons in early 1553. Servetus’s alias, whereabouts, and the fact that he had authored The Restitution of Christianity, were exposed in an exchange of letters between a Catholic from Vienne and his Protestant cousin, Guillaume de Trie, a Genevan friend of Calvin’s. Ultimately, at the request of French authorities, de Trie forwarded documents from Calvin, securing Servetus’s conviction. For some, this proves that Calvin was orchestrating Servetus’s destruction. However, Calvin only reluctantly supplied the information at the pleading request of de Trie, thereby allowing de Trie to keep his word to his cousin in Vienne. Calvin did not believe assisting the papal sword to be the proper way to fight heresy. Servetus avoided execution by escaping. The Catholics burned him in effigy. …if the second Person assumes Mary as it assumed CHRIST, then the Sophists admit that Mary is CHRIST, CHRIST bore the Son of God, CHRIST is his own mother, CHRIST is man and woman (pray restrain your laughter if you can)….Basil the Great…maintains with singular mistakenness that he is called begotten, and not a created being; a Son, and not born…whether the third Person proceeds from the Father and the Son, or from the Father only, as the Greeks say, is a very bitterly debated, vain, and ancient problem, which I shall later solve with ease. I…say of Servetus, what the ancient Fathers…wrote concerning the twin monster, Paul Samosatenus and Arius…that with them originated those fires by which the whole churches of Christendom were afterwards in a blaze. For punishment was most deservedly inflicted on Servetus at Geneva, not because he was a sectary, but a monstrous compound of mere impiety and horrid blasphemy, with which he had for the period of thirty years, by word and writing polluted both heaven and earth. Even now it is impossible to say how much the influence of Satan has been increased…. Calvin’s refutation of Servetus was not about winning theological arguments, but about protecting the flock. Beza notes that Servetus was not merely a sectarian endangering his own soul with heterodox personal beliefs. He was the worst kind of heretic: the publishing kind. Calvin believed it “useful to refute Servetus’s grosser deceptions, with which he has bewitched himself and certain others,” hoping that “godly readers” would recognize that “the crafty evasions of this foul dog utterly extinguished the hope of salvation.” Calvin saw himself as God’s watchdog over the flock and Servetus a heretical wolf. Alister E. McGrath, A Life of John Calvin: A Study in the Shaping of Western Culture (Oxford: B. Blackwell, 1990), 114, as it has become known. Herman J. Selderhuis, John Calvin: A Pilgrim's Life (Downers Grove: IVP, 2009), 205. Herman J. Selderhuis, ed. The Calvin Handbook (Grand Rapids: Eerdmans, 2009), 484, quoting Voltaire's An Essay on Universal History. Accusations the author has encountered in conversation, framed as Servetus the independent Anabaptist executed by Calvin the power-wielding paedobaptist. Roland H. Bainton, Hunted Heretic: The Life and Death of Michael Servetus, 1511-1553 (Providence: Blackstone, 2005), 78-79. Donald K. McKim, The Cambridge Companion to John Calvin (Cambridge: Cambridge University Press, 2004), 197. Bruce Gordon, Calvin (New Haven: Yale University Press, 2011) 217; "bad blood" above is his term. John Calvin, Letters of John Calvin: Selected from the Bonnet Edition with an introductory biographical sketch (Carlisle: Banner of Truth, 1980), 79–80; in a Feb. 13, 1546, letter to Jean Frellon, the Huguenot publisher that Servetus had edited some books for, and who functioned as mediator through whom they corresponded using pseudonyms; See Bainton, Hunted, 97. Ibid., 82; in a letter of the same day as above. Lawrence Goldstone and Nancy Bazelon Goldstone, Out of the Flames: The Remarkable Story of a Fearless Scholar, a Fatal Heresy, and One of the Rarest Books in the World (New York: Broadway, 2002), 155–57. Bainton, Hunted, 97; no defender of Calvin, Bainton is correct here. Ibid., 103–5; it was the Catholic Frenchman that initiated the epistolary exchange which amounted to exchanging jabs at each other's respective city's willingness to put up with heresy. 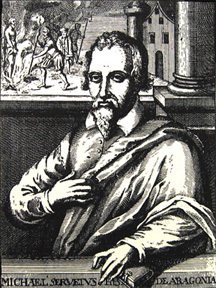 Marian Hillar, The Case of Michael Servetus (1511-1553): The Turning Point in the Struggle for Freedom of Conscience (Lewiston: E. Mellen Press, 1997, 276–78. 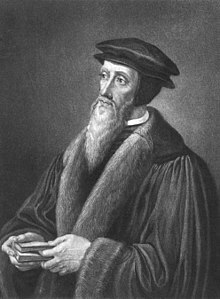 Willem van’t Spijker, Calvin: A Brief Guide to his Life and Thought (Louisville: Westminster John Knox), 95; Bainton, Hunted, 106–7; both Calvin and Trie claimed this. John Calvin, Institutes of the Christian Religion: In Two Volumes (Louisville: Westminster John Knox, 1960), 147. Servetus appears to be the first to apply the term “Trinitarians” to those holding orthodoxy views on the Trinity. Randall C. Zachman, John Calvin as Teacher, Pastor, and Theologian: The Shape of His Writings and Thought (Grand Rapids: Baker Academic, 2006), 84. Michael Serveto, The Two Treatises of Servetus on the Trinity: On the Errors of the Trinity (7 Books, 1531) (Cambridge, MA: Harvard University Press, 1932), 64–65; Sophists being those who defend Nicene Trinitarianism and Christ's full eternal deity, naming also "the great theologian Nazianzen" and Augustine as others who were mistaken on these points. Spijker, Brief Guide, 94; in his own home, getting to know his views well. Philip Schaff, History of the Christian Church, Volume VIII: Modern Christianity. The Swiss Reformation. (Online: Christian Classics Ethereal Library), Accessed Oct. 7, 2016, Sec. 139; mild Bucer declared publicly Servetus deserved to "be disemboweled and torn to pieces" for his blasphemy. John Calvin, Selected Works of John Calvin: Tracts and Letters (Grand Rapids: Baker, 1983), 1:lxv; italics mine.